The birth of chemistry coincides with the first time people became aware that they could improve upon that nature offered. By observing lightning, fire, decay, and other natural phenomena, primitive people eventually discovered that the properties of objects could be altered. after harnessing fire, ancient people solved day to day problems more efficiently. Pottery or bricks were formed from baked clay. Through trial and error ceramics, glazes, and glasses were discovered. Advances in primeval "chemistry" helped people develop the foundation for civilization. During this early period of history, now called the stone age, people saw that their lives were simplified through the development of new materials. The search for new substances to replace their stone tools led to the discovery of metals. metals added a new dimension to life. Unlike stone, metals could be hamered and shaped into a multitude of forms. Weapons created from metals remained sharper longer than stone counterparts, and metal weapons could be resharpened. Copper, gold ant tin were the first metals used - a coper cooking pan wa found in a egyptian tomb dating back to 3200 BC. Sometime around 3000 BC a startling discovery was made. If copper and tin ores were heated together, a new metal ( an alloy ) was obtained which was much harder than either copper or tin. The metal, bronze, ushered in a new era-the bronze age. A thousand years elapsed before the bronze age ended. it was common knowledge that a superior metal iron, existed. But it was rare, and no method was readily available to extract the metal from its ore. In approximately 1500 BC, The Hittites , a group of people who lived in Asia Minor, found a means for liberating iron from its ore via a method that is a forerunner of our present day smelting process. By chance, the hittites heated iron ore in charcoal smelter, producing an iron-carbon mixture resembling steel. Thus the world was thrust into the the iron age about 1000 BC. During the iron age, other practical chemical advances were made. In egypt, chemicals were incorporated into all aspects of life and death. The Egyptians produced alcoholic beverages by fermentation, concocted embalming fluids to preserve the dead, and developed pigments, dyes, and paints that have lasted the modern times. The greeks , about 6000 BC , were the first people to pose questions why matter acted as it did. They wanted to know why certain metals, when heated, were change into new substances, whether there were certain basic forms of matter ; and if any metal could be changed into any other metal. Greek scholars sought to determine the composition of the universe. Thales of Miletus was one of the first greek philosophers to conceive the idea of "elements" Thales suggested that element were the fundamental form of matter. 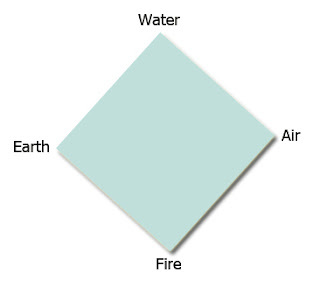 Other greek thinkers looked to nature and speculated that the entire universe was composed of four elements ; Earth, air, fire, and water. Aristotle accepted and advanced the four element theory. He suggested that in addition to the four basic elements there could be two pairs of opposite qualities : Hot-cold and wet-dry. 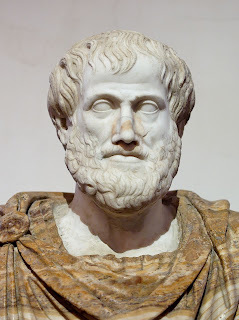 Aristotle also believe that each element had its own set of properties - earth should fall and fire should rise. With each modification to the four element theory , a greater number of plausible answers were proposed to questions and problems that had puzzled humankind for centuries. Today, some people might think of these ideas as humorous or simple minded solutions to complex problems . Nevertheless, the four element theory in a variety of froms, lasted for almost 2000 years. The longevity of the theory is attributed , in part, to its simplicity. Many problems of nature are effortlessly explained in terms of earth , air , fire, and water. Greek philosophers also attempted to understand the problem of breaking down matter into smaller parts. If a stone was broken or crushed, could the fragment of stone be further subdivided ? If so, was there a point at which the fragment could no longer be divided ? Leucippus and his disciple Democritus ( About 450 BC ) proposed the idea of the atom. The word atom is derived from the greek term for "indivisible". Democritus suggested that the smallest particle of the matter was an atom-a unit of matter that was indivisible. Democritus also speculated that atoms in different substances varied with respect to size and shape.This was an incredible proposition , considering that Democritus was a philosopher one who proposes ideas about nature through logic. He was not a true scientist – one who conducts controlled systematic experiments based on observable facts. From approximately A.D 300 to A.D 1100 the dark ages prevailed in Europe and chemical advancement came to a standstill . However, in another part of the world, Arab cultures continued to make significant chemical contributions during the dark ages. A small group of Arabs tried to find a way to convert cheap, abundant metals to gold. This period in chemical history is now known for these dedicated men who searched for gold the alchemist. As part of their quest to change metals to gold , alchemist attempted to find the magic elixir of life, or as it is better known , the philosopher’s stone . It was thought that the pjhilosopher’s stone could rid one’s body of disease and was the key to eternal life. Thousands of people searched in vain for gold and the magic elixir. Even though the alchemists never achieved their goals, they did uncover a vast amount of chemical knowledge . Various contemporary laboratory techniques and instruments are traced to them. Historians believe that the term chemistry is derived from the alchemists term for mixing chemicals. Alchemy lasted over 2000 years, from the period before the birth of Christ until the eighteenth century. Alchemy died and chemistry emerged because curious people started to ask more probing questions about matter : what explains the behavior of matter ? Was all matter composed of only earth, air, fire, and water ? Do all substances act in a predictable , regular manner ? Robert Boyle , an Irishman, saw the shortcomings of alchemy , and decided to apply what is known as scientific reasoning to the study of chemistry. Boyle followed the lead of other great scientific investigators of this time : Galileo Galilei, Van Helmont, Toricceli, Otto von Guericke. Boyle’s exacting studies of gases and their properties supported the idea proposed 1000 years before by certain greek philosophers – that matter is composed of atoms. In his famous book The Sceptical Chymist, published in 1661 Boyle attacked the old idea that matter is composed of only four element . In stead, boyle proposed that if a substance thought to be an element is capable of being broken down into simpler forms, then it is not an element. One of the most significant outcomes of boyle’s work is the idea of experimentation that any propositions regarding matter must be supported by reproducible observations. Other scoientists of the seventeenth century were concerned with the nature of energy, which they called “fire”. Their interest was spurred by the invention of the steam engine and by the possibility of developing more efficient engines capable of performing heavy work. Scientists wanted to know why certain substances burn while others do not, how heat is transferred from one object to another, ad the nature of the combustion process. A german physician and chemist , georg Ernest Stahl proposed the phlogiston was derived from the greek term meaning to set on fire . stahl’phlogiston theory described combustible objects as those containing a large quantity of phlogiston. As an object burned, Stahl suggested that phlogiston flowed from the object and the object stopped burning when all of the phlogiston was released. A log burned because it contained phlogiston . The resulting ashes lacked phlogiston ; hence, ashes were noncombustible. Joseph Priestleys discovery of oxygen as a component of air, and its ability to support combustion, brought about the end of the phlogiston theory. Priestly informed Antonie Lavoiser of his discovery of oxygen. Lavoiser immediately repeated Priestley’s experiment s and found that oxygen was truly formed. But lavoiser saw something much more important mathematics could explain the decomposition of matter. When dealing with matter, Lavoiser found that the whole was equal to the sum of its parts. 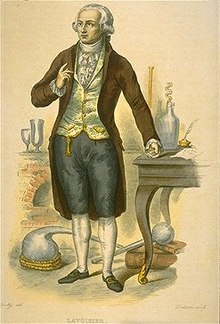 He then conducted a classic experiment : he heated mercury and oxygen to show conclusively that oxygen and not phlogiston supported combustion. Lavoiser possessed a rare talent found in few people who have ever lived he correctly organized interpreted a large body of facts, yielding a completely new area of human concern, that of modern chemistry. We see chemistry in action daily, for example when we cook meals, wash clothes , wax furniture , or eliminate pests , we are involved with chemistry . The "art" of cooking employs chemical techniques in frying , baking, roasting, and boiling. Cleaning involves selecting the soap , detergent, or cleaning fluid that best removes dirt and stains. Waxes are rubbed or sprayed o surfaces to protect and beautify. Insecticides are used to rid our houses and gardens of insect pests. Home recreation incorporates many advances in chemical technology. Color televisions sets contain substances called phospors that glow various colors when hit by an electron beam. Magnetic recording tape is manufactured by affixing various metallic substances to a plastic tape that is strong and does not stretch or shrink . Advances in the chemical processes used to manufacture transistors and intgrated circuits ( ICs ) have resulted in personal computers , video tape recorders giant TV screens , electronic gamers, and superb high fidelity stereophonic sound system. Modern means of transportation also rely on the chemical industry. Pasengger jets are able to fly faster and carry more people as a result of strong new metals used in the bodies of aircraft. In addition, new jets have an ever increasing number of tough plastic parts. Plastic parts are superior in many ways to the heavier, more costly metal parts they replace. The same is true for automobiles. Each year the number of pounds of plastic per car increases. In part, the increased gas mileage of new cars is due to the decreased weight of the cars. Modern Society is becoming increasingly dependent upon the advances of chemistry. To a degree, people expect chemists to rescue them from the clutches of life's problems and annoyances. 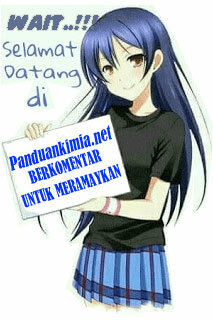 But, unfortunately, with each new advance we must pay some price. Environmental problems result from byproduct of the chemical industry. New health problems are caused by life-saving drugs. Pesticides used to protect our crops accumulate in our bodies , causing serious helath problems. 0 Response to "Early History Of Chemistry "